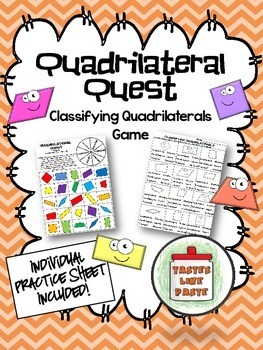 Looking for a great way to practice classifying quadrilaterals? I don't know about you, but plain old practice sheets were getting boring, and not allowing my students to build the knowledge of shape hierarchy. We loved playing this quick spinner game in class! 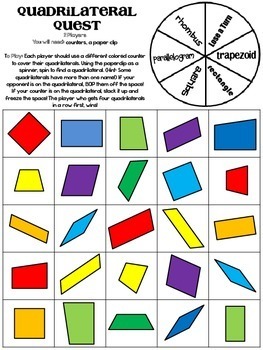 To Play: Each player should use a different colored counter to cover their quadrilaterals. Using the paperclip as a spinner, spin to find a quadrilateral. 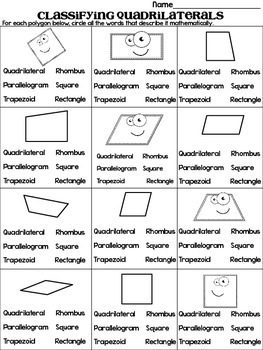 (Hint: Some quadrilaterals have more than one name!) If your opponent is on the quadrilateral, BOP them off the space! If your counter is on the quadrilateral, stack it up and freeze the space! The player who gets four quadrilaterals in a row first, wins! "A quadrilateral with one set of parallel lines." If you define this differently (i.e. 'at least one set of parallel lines'), please adjust the key to your liking.